Published – A third party must have heard or seen it. False – The statement must be proven to be objective false, not just someone’s negative opinion. Injurious – The person suing must show they lost work, were ostracized or bullied by friends or family, or were harassed by the press. Unprivileged – A statement by a witness in court or by a legislator in a legislative session would not qualify – these are “privileged” settings. At the same time, understanding how very deep and long-lasting the injury can be to a victim of defamation, as personal injury attorneys, we are dedicated to helping those victims recover damages through the court system. Harm to reputation – For a business owner, false allegations can drive away customers. An employee can lose his or her job. Financial harm – Not only will loss of business or loss of employment accompany harm to reputation, victims can incur expenses in trying to repair the damage. Mental or physical anguish – health problems such as insomnia, depression, and anxiety can result from enduring false statements. 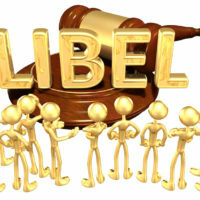 When a victim’s injury is severe, yet not physical in nature, caused by defamation or slander, our mission as personal injury attorneys becomes to bring legal action against the guilty party, taking defamation of character to court!